Akao Aluminum will continue to offer excellent aluminum materials and products with the following management philosophy and management policy (code of conduct). The aluminum rolling industry is to provide the final products of aluminum material of which their application fields continue to expand, and this quality greatly affects the performance and design of the final product. Also, using that material, enriching the lives of everyone with high quality Japanese products such as kitchenware. We strongly acknowledge the magnitude of our responsibility, and we have been working humbly, seriously, and with enthusiasm. On the other hand, the business environment is changing dramatically in the aluminum market, including the fields of use and competition with overseas companies. We constantly continue to provide customers and society with the value of Akao Aluminum by capturing this change. 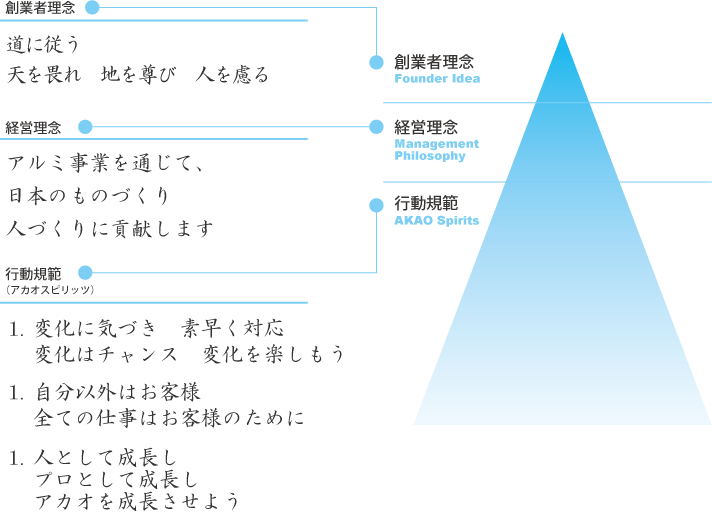 We have defined Akao Spirits as each one of our employees growing as a person in such environment. This Akao Spirits also represents the founding philosophy of Shiro Akao, the founder of the company.